Now that Halloween is over I can’t stop myself from looking at 2 things: Food recipes for Thanksgiving, and tons and tons of Christmas decorations! I know I’m not the only one, though, as I’ve heard many people admitting they can finally listen to their Christmas music now without feeling judged. Since it’s not quite close enough to those holidays though, I’ll refrain from the holiday DIY projects for a little while and be content with beautiful lighting decorations. These would work not only for the holidays, but also for the changing seasons or even just for that dark hallway, entryway, corner, or table that you want to brighten up. All of these projects are so simple and of course, very affordable! Some may even include you heading outside to find your materials! Seeing my mom struggle year after year with mantle decorations has left me laughing at many times, but searching for many different ideas that add height and light to the dark brick area. For this project, search the woods for tall, thin tree branches and limbs. 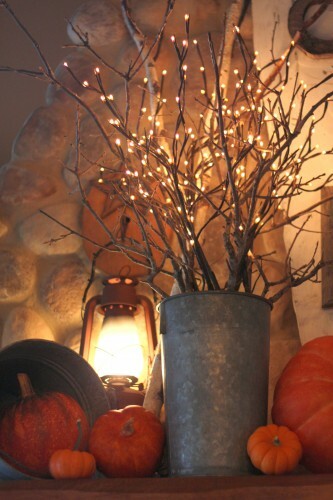 Combine these with lighted branches that you buy in a skinny, metal bucket and instantly you have a great mantle decoration, centerpiece, or something for an empty corner in your house that needs to be livened up. 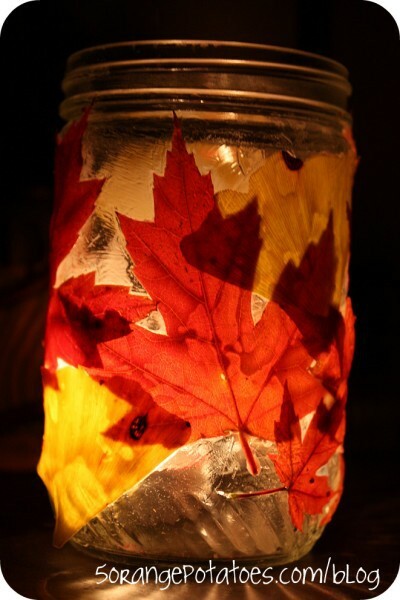 For this and a ton more Fall project ideas, go to http://www.sugarpiefarmhouse.com/aunt-ruthies-autumn-home-tour. Want to make a creative candleholder? They’re referred to as rustic, and I can just see them fitting in perfectly in a cozy log cabin. 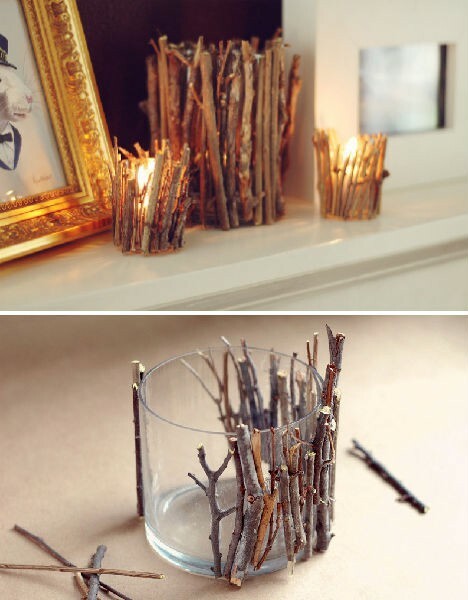 Simply get a small, clear glass candleholder and glue twigs, found outside, around the edge. You could also use cinnamon sticks, rather than twigs, for the Christmas season. Want some more outdoor project ideas? 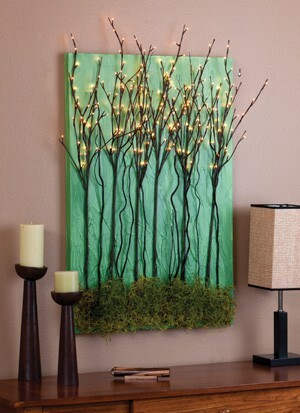 Go to http://webecoist.com/2011/07/25/diy-decor-inspiration-14-eco-crafts-for-the-home/?ref=search. 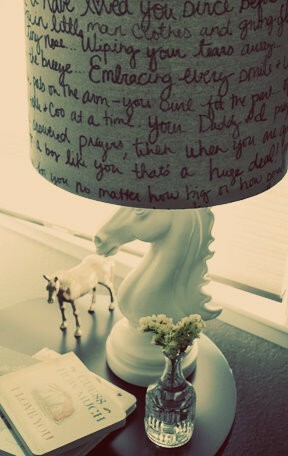 This lampshade idea is romantic and elegant. I love the idea of being able to write poems, stories, song lyrics, or even a loving message on to your lamp shade and let the lamp cast the word’s shadows on the wall. Ok, granted this isn’t a lighting idea but I love birds, and I really love houses decorated with vintage birds. This is just too adorable to not include. 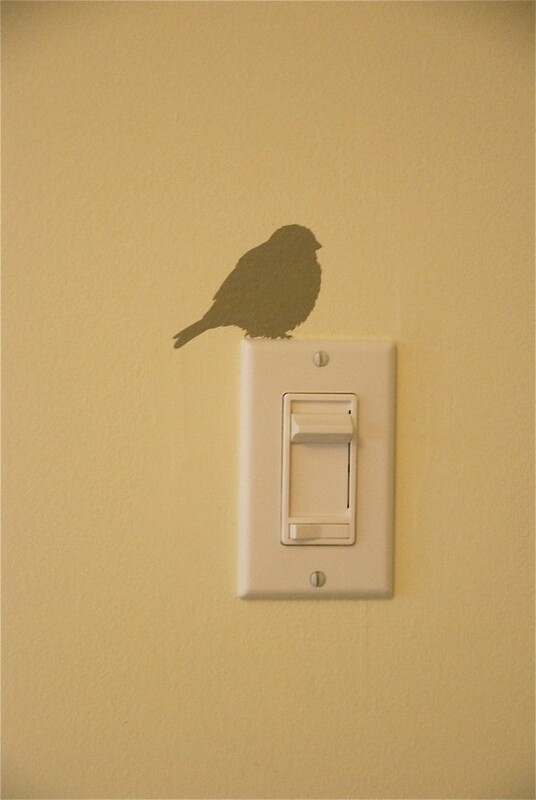 Seeing a little bird perched on my light switch every day would make me smile. It’s a great small touch. 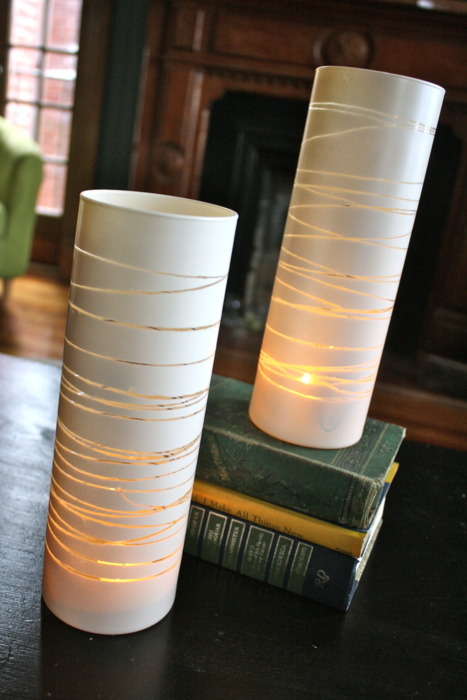 This candle holder, or vase, is so easy and looks like it would be fun and fast to make. Get a clear, tall glass vase. Place rubber band around it, forming the design that you want on the vase. Spray paint the whole vase covering the rubberbands. After you let the paint dry remove the rubber bands you should have very clear distinct lines! I really like the look of this light silver. If you've tried any any of these projects or any other DIY project you uncovered we'd love to see the pictures! Send the pics to us at nclac5@gmail.com.